Last week the third cohort of students from the Cass Business School, City University London, Dubai Executive MBA (EMBA) programme graduated in a ceremony held at the Dubai International Financial Center (DIFC) under the patronage of H.H. Sheikh Maktoum Bin Mohammed Bin Rashid Al Maktoum, Deputy Ruler of Dubai and President of DIFC. The prestigious event was attended by His Highness Sheikh Ahmed Bin Saeed Al Maktoum, Chairman of Dubai Airports, President of Dubai Civil Aviation Authority and Chairman and CEO of Emirates Group. An appreciative audience of family, friends, Cass alumni and business partners heard from City University London Vice-Chancellor Professor Paul Curran; Cass Dean Richard Gillingwater CBE; Cass Associate Dean, MBA Programmes Professor Roy Batchelor; and Victoria Cox, who spoke on behalf of the graduating class. Dr Nasser Saidi, Chief Economist, DIFC Authority, gave the keynote address which covered both the opportunities and challenges currently facing business in the region. A total of 23 different countries are represented in this year's graduating class, including students from as far away as Argentina, Australia, China and the USA. The cohort hail from industries including energy, engineering, commerce, manufacturing, finance, legal and government. His Excellency Abdulla Mohammed Saleh, Governor of DIFC, said: "DIFC is proud to support educational programmes with Cass' quality that build up human capital for the financial services sector in the region, and help us deliver on our mandate to place Dubai and the UAE in the top league of international financial centres. These programmes provide professionals with the opportunity to access the very best of global management thinking, research and practice, equipping them with the analytical tools and knowledge to face the rapidly evolving business world." Professor Curran continued: "It is with enormous pride that we celebrate the graduation of the third cohort of EMBA students from our DIFC campus. Since opening in 2007, the Cass Dubai Centre has established itself as a dynamic hub for business education in the Middle East, offering regionally relevant electives delivered by world class academics. The class of 2012 join hundreds of fellow alumni who have earned the prestigious Cass EMBA degree and are now forging careers at the very top of the global business community." "Consistently ranked among the best in the world, the Cass EMBA programme is designed to unlock the potential of outstanding individuals and create an accelerated career path," said Ehsan Razavizadeh, Cass Regional Director, MENA and Head of Cass Dubai Centre. "I extend my congratulations to all our students on successfully completing the rigorous 24-month course, and I look forward to hearing about their progress at one of our frequent alumni events across the world." 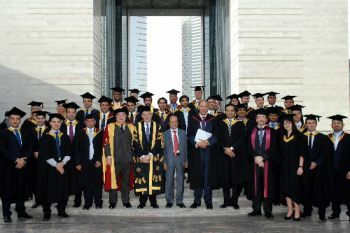 As the first EMBA programme in the world to offer specialisations in Islamic Finance and Oil and Energy Economics, the Cass EMBA is regionally-relevant, offering electives in Entrepreneurship, Leadership and Change Management, Advanced Corporate Strategy, Islamic Economics, Islamic Law of Business Transactions, as well as Mergers and Acquisitions, Advanced Corporate Finance and Private Equity. The Cass EMBA continues to increase in popularity, with student admissions to the programme in Dubai growing by 80 per cent since 2007.